I wish to discuss three strategies that I have implemented utilizing narrative to enhance the textbook experience in the study of Hinduism. I have been teaching an introductory semester-long course in the Hindu tradition for about twenty-five years. By the end of each year of my first decade of teaching, my students and I were roundly disappointed with the various textbooks we had used in the course that year. Although well written and bursting with promise, the books were not well received by my students. They were often too chock-full of information, discussing dozens of minor Hindu sects and with needless references to scholars and their conflicting theories. Closer scrutiny revealed why they had initially appealed to me: they were partly written for the author’s peers, namely, the professor who chooses the course texts, and not for the novice students who must slog their way through those poor choices. It is only when I accepted the offer to write a textbook of my own, Hinduism – The eBook, that I fully appreciated the reason why so many textbooks fail: when crafting the text, it took sustained effort to keep my intended student audience constantly front and center, because I was perennially concerned about how my peers would evaluate my competence. Such fears are healthy if they enhance the quality of one’s work. However, they undoubtedly and unfortunately lead authors to include materials—such as the names of fellow academics and their cutting-edge debates, or erudite references to innumerable sectarian variations—which are largely irrelevant in the initial stages of the study of any religious tradition. As an aside, I hesitantly jumped at the opportunity to write the eBook, but only after overcoming my initial reticence about digital books by reflecting on their potential. One must remember that this was about fifteen years ago, when anything academic produced in digital media, such as e-journals, was viewed with skepticism. Writing an introductory textbook was far more challenging than I had imagined because it required becoming familiar with the most recent scholarship in the fullest compass of the religious tradition. It is quite easy to produce an inadvertently lopsided text that emphasizes one’s own areas of expertise, even as one simultaneously needs to make judgements about what topics to include or reject and the depth to which they might be covered. Finally, one has to condense that information in a manner that was both accurate and accessible. After struggling with these and other challenges, the eBook was eventually completed. A few years later, along with other eBooks in the series, it was adopted and produced by Routledge in a printed version as Introducing Hinduism. In rigorous, detailed reviews by numerous professors in the United Kingdom, Canada, and the United States who had used it for years in their classrooms, the technique of narrative inclusions was unanimously lauded as highly appealing to students, and second editions have recently been released. Even so, the potential that I envisioned fifteen years ago in the construction of an eBook, with embedded audio and video, rich interactive graphics, and so on, is still far from being fully realized. In Hinduism – the eBook, I broke the mold of traditional textbooks by inserting about half a dozen narrative vignettes, often at the start of certain chapters. I knew I was taking a risk in doing so, but I could not bring myself to create just another conventional textbook no matter how wonderful its content. To confess, these are stories of my experiences, but they are not framed as such, and for all intents and purposes could be fictions. I opted not to use fictional vignettes, because those might be vulnerable to the criticism that they are unrealistic. 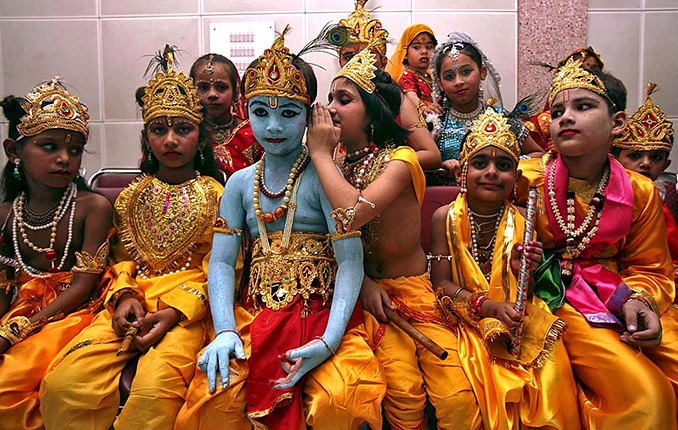 The vignettes begin with the phrase, “Imagine, if you will, this scenario,” which invites the student to enter a vicarious discovery of Hinduism as it might really unfold in one’s experience. Thus, instead of reading about the author’s experience, readers are invited into the narrative, which is written in the second, rather than the first, person. It is not “I was horseback riding . . .,” but “You have been horseback riding in the countryside of the state of Rajasthan and return late to your lodge on the outskirts . . .” Since Hinduism, as it is lived and practiced, cannot adequately be captured by generalizations, the personal vignette is effective at evoking the intrinsically situational character of religion and culture as it is experienced. In this I have been influenced by postmodern theorizing in anthropology, where self-disclosure of the ethnographer’s experience—revealing something of the encounter between the researcher and the researched’s cultures—is now normative. There is more to this technique than it simply being a strategy to gain the reader’s attention. Personal experience is vital in establishing ethnographic authority, because it assures the reader that you are not merely conveying second- or third-hand information. You were there, saw this and heard that, and these first-hand experiences have contributed to your understanding. This also constitutes part of the rationale behind the third strategic technique discussed below. The third strategy is an extension of the previous two, wherein I edit a textbook series entitled Studying Religions in Practice. The series plays on two connotations in the title, namely, 1) “studying religions in practice,” and 2) “studying religions in practice.” In the first connotation, books in this series strive to address situational expressions of religions as they are enacted. Certain scholars have criticized conventional Hinduism textbooks for presenting a master narrative that privileges the Brahminic, textual tradition. They press for books that convey the messy, lived, and highly varied expressions of Hinduism or Hinduisms, especially of marginalized segments of society whose voices are often ignored. The narrative vignettes in my texts, which I discuss above, go some distance to undercut the notion of a monolithic Hinduism, which is another rationale for their inclusion. However, Studying Hinduism in Practice addresses this concern much more effectively, and is therefore a worthwhile complement to any good textbook. It is the sort of collection that provides glimpses into a wide assortment of Hindu activities. The second connotation, “studying religions in practice,” emphasizes the practice of studying and researching about religions. This feature is generally overlooked in most conventional textbooks, which are written with a dispassionate, authoritative voice. A Hinduism course in a secular university setting should not only teach about the tradition but also provide an opportunity to reveal a bit about the process of research. After all, what better time to teach about how researchers learned what they know and possibly inspire students to continue in the same vein? This too is where narrative is an extremely effective tool. In contrast to books about Hindu practice written from the perspective of polished, accomplished researchers, Studying Hinduism in Practice shares stories about the researcher’s raw experience “in the field.” Contributors were obliged to step out of their cultivated, and now habitual, academic styles and write a story about their experiences when studying a feature of Hinduism. The tales avoid analytic details derived from subsequent research and reflection; rather, they are simply descriptive accounts of the events, thoughts, and feelings of the researchers while they were engaged in those experiences. Yes, I did say thoughts and feelings. A holistic subjectivity is crucial for the success of a personal anecdote. Once student readers are hooked by the tale, and imaginatively join with the researchers in their experiential adventures of discovery, they are more likely to continue reading the second halves of the chapters, which are academic analyses of some facet of the researchers’ experiences. When teaching, I often ask students about their reactions to the narrative half of a pertinent piece in the collection—what they found intriguing, surprising, or perplexing about it, and what questions it elicited. Response to the narratives is quite effective at initiating classroom discussion because students do not have to demonstrate knowledge or feel that they have to ask intelligent questions. We are all affected by stories, and we all can speak easily about our reactions to them, as well as pose questions that the tales made us wonder about. Editions on Hinduism, Buddhism, and Islam in this series have already been released. In conclusion, I would encourage my colleagues and would-be instructors to revisit textbooks, especially if they have been inclined to reject them entirely in favor of an assortment of primary texts, such as the Bhagavad Gītā. In my experience, students feel reassured to have a reliable general resource at hand. Despite their many shortcomings, accessible and informative textbooks, particularly if they are engaging to read, can better serve as that reliable reference than Wikipedia or a half-dozen primary sources. Moreover, if instructors have been awakened to an appreciation for the effectiveness of narrative, I would further encourage them to make healthy use of anecdotes about their personal field experiences when teaching. Having had the good fortune to travel extensively in South and Southeast Asia, I insert copious photographic imagery from my fieldwork into PowerPoint slides in my teaching. Hindu lithographs often depict deities with unusual attributes, and reliefs from temples often portray episodes from myths. A still shot of a ritual being enacted may scream out for a much longer explanation. Why is that man pouring boiling hot milk over his body on the grounds of a goddess temple while an astonished crowd of spectators looks on? Even if the images have not been obtained from one’s own photographs, they may still serve as springboards for anecdotes that reveal something about Hinduism as a complex living tradition or provide opportunities to recount in more detail a myth portrayed in a sculptural relief. These stories should not be used to make sweeping generalizations about the tradition from a single piece of anecdotal evidence, but rather to enrich one’s students’ classroom experience. Stories connect authors and readers, or tellers and listeners, far more intimately than impersonal and merely informative modes of communication. Within the receptivity and focus that is induced when one is absorbed in reading or listening to a tale, learning inevitably occurs. 1 Hillary Rodrigues, Hinduism – the eBook, 2nd ed. (Journal of Buddhist Ethics Online Books, 2016), 245. Hillary Rodrigues is a professor at the University of Lethbridge. He is currently chair of the Department of Religious Studies, and the former chair of the Department of Anthropology. His ongoing research is on the Hindu goddess Durgā, as well as the modern, nondual spirituality movement. He teaches a range of undergraduate courses, primarily on Asian traditions and philosophies. His books include Ritual Worship of the Great Goddess (SUNY Press, 2003) and the coauthored Introduction to the Study of Religion (Routledge, 2009). Cayanus, J. L. “Using Teacher Self-Disclosure as an Instructional Tool.” Communication Teacher 18, no. 1 (2004), 6–9. Clifford, James, and George E. Marcus, eds. Writing Culture: the Poetics and Politics of Ethnography. Berkeley: University of California Press, 1986. Marcus, George, E. “Ethnography Two Decades after Writing Culture: From the Experimental to the Baroque.” Anthropological Quarterly 80, no. 4 (2007), 1127–1145. Palmer, Parker, J. The Courage to Teach: Exploring the Inner Landscape of a Teacher’s Life. San Francisco: Jossey-Bass, 2007. Rodrigues, Hillary. Hinduism – the eBook. 2nd ed. Journal of Buddhist Ethics Online Books, 2016. ———. Introducing Hinduism 2nd ed. London and New York: Routledge, 2016. ———. Studying Hinduism in Practice. New York: Routledge, 2011. Rodrigues, Hillary, series editor. Studying Religions in Practice. London and New York: Routledge Publishers, 2011–12.